I want to share how automated marketing was one of key elements for us, Automile an early stage SaaS targeted at solving daily pains for businesses that have cars, becoming #1 in our local market in less than a year and how it’s affecting our growth in all other markets. We now have thousands of businesses with thousands of subscriptions across a number of countries just after 2 years in business. I believe inbound marketing is great but I often see many startups steering blind around this. So let’s write something that may surprise and change how you should think about inbound vs. outbound marketing in the future. Use them both and you grow faster. Interested to join Automile as VP of Marketing don’t miss out the opportunity here. It’s Sunday and we are planning for the coming week marketing activities. We already by 24th (today) reached our 100k quota at SendGrid with amazing CTR at about 8,4% and a couple of hundred sold subscriptions last few days. The office is like a machine with all amazing automation you can ask for feeding the sales team many opportunities per minute. Tomorrow 2 new sales team member’s starts and from 1th February another 3 sales members starts. Just 8 months ago we were sitting in a small office with a strong development team hiring our first sales team member in March 2014. With automated marketing, ton’s of hacking and execution performance and what we believe is a great product has put us as #1 position in our local market in number of customers / businesses. Our US launch in October has accelerated and we are now serving hundreds of businesses growing rapidly with the same methodology only with slight differences in communication. So what have we done to reach this position? We source all acquired and owned vehicles for businesses from either local authorities or information providers and we are today sitting on more than 500 000 businesses that have more than 3 vehicles and less than 100. This is done continuously so in some countries we even know that your friends company yesterday bought a new vehicle. The second step is to source all data around the business, which can involve revenue, number of employees etc. We use a variety of sources for this, ranging from ZoomInfo to local market players. The third step which was the most difficult thing to scale before we recently figured it out was how get hold of very accurate contact data including e-mail and direct mobile phone number to the person likely to decide to try a service from us. ZoomInfo could be one source but they are not enough (and very expensive by the way). Today we have over 100 students working for us feeding our data with the insight we need. A smart light web app enables the students to work anywhere and earn a micro fee for each piece of information they manage to get hold of. 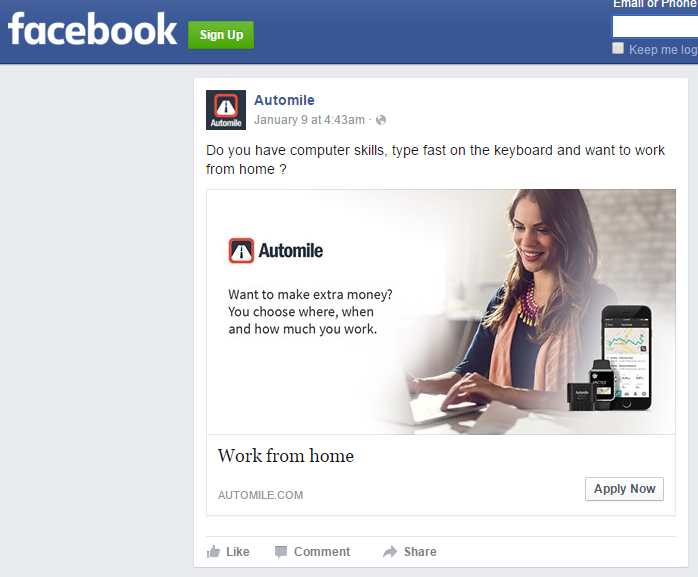 We got over 500 applicants in less than 24 hours after running a small ad on Facebook. First 14 days this team generated over 50 000 qualified leads (some wouldn’t call them leads but I do) with 170 000 data points. We were amazed by how fast this went. With all this information you basically know everything about your customers and all of them may be your targets. Asking a large sales team to cold-call everyone is going to be a pain and likely you are ending up with a solution that doesn’t scale with a large CAC. We start by analyzing the data by defining geographic spread, industry and number of vehicles, age of fleet and the age of the contact we are suppose to engage with. With historic insight we know which one is likely to sign-up versus another. We select a target group, typically from 20 000–40 000 businesses and start what we call the 10 day plan aiming at trying to narrow down the target group to businesses likely converting to customers. This 10-day plan is fully automated and consists of these parts. Some markets permits us sending a text message to a person at a business without any consent. So we send a single text message from a personalized sales member pointing directly to a virtual mobile phone number that the user can respond to or call. The text messages always includes a link were we also tell the user were we got the information and that we will not send more than one text message. CTR is extremely high 30–40% and we got very few complaints about using text messages as a part of our tactics. Most e-mails I personally get from sales people trying to offer me a solution don’t make me jump. What I prefer is trying to establish a conversation with the target customer. I prefer e-mails contain a mix of advise with maybe a single question that feels personalized. When we draft templates we distribute them in a small group to try them out before they go out. In the beginning of this article you can see that the CTR on our campaign’s have around 8% as a benchmark. The automated marketing system will try getting a conversation started during these 10 days and get as many businesses as possible to respond according to a) to e) above. This involves thousands of e-mails going back and forth. We have hacked together a number of connectors that analyses the responses to determine next steps. 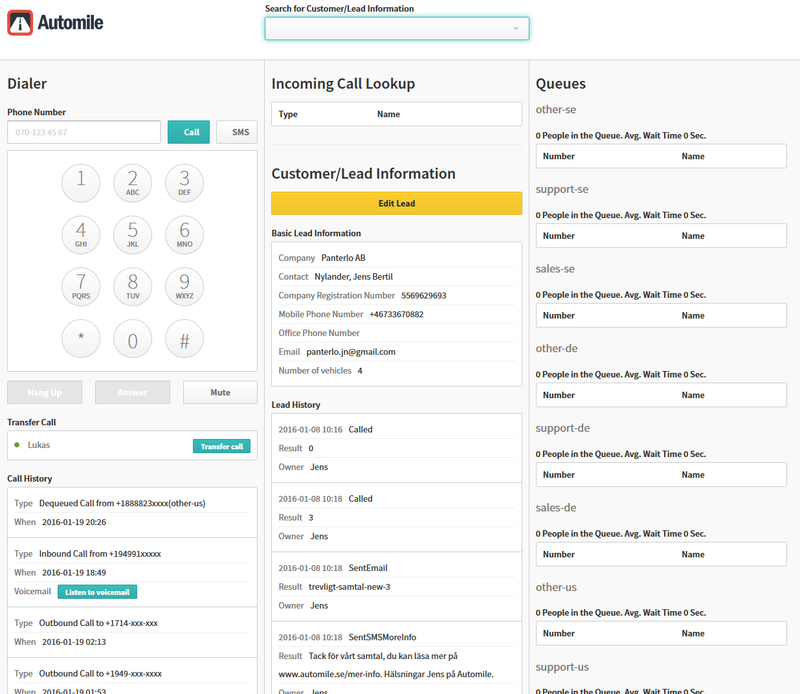 If the customer clicks any links they are put on what we called a target dial list. We will talk about this later in this article. If b) happens an automatic e-mail is again sent out personalized about what existing solution the customer may use and if it’s a service that is going to be renewed and if so when it’s time to renew. The system then keeps track of trying to get enough attention from the customer to consider us before renewing any existing solutions. This is extremely efficient and also helps out determining competitor penetration and market possibilities. The last step in the process is calling the customers that have expressed interest or at bare minimum have heard of us. The first call is much more responsive if you take the steps in the 10 day plan and execute in order. To support this we built a web dialer app integrated in our admin systems that allows the sales members to be much more efficient. Each sales team members is doing about 150 calls a day and have about 20 000 leads on their account. It’s very difficult for anyone with that size to remember whom they spoke with, their response and what the next step was. That’s why we built a workflow engine, a single screen / pages were the sales team members works all hours during a day. This workflow enables them to capture and do all work without loosing focus. 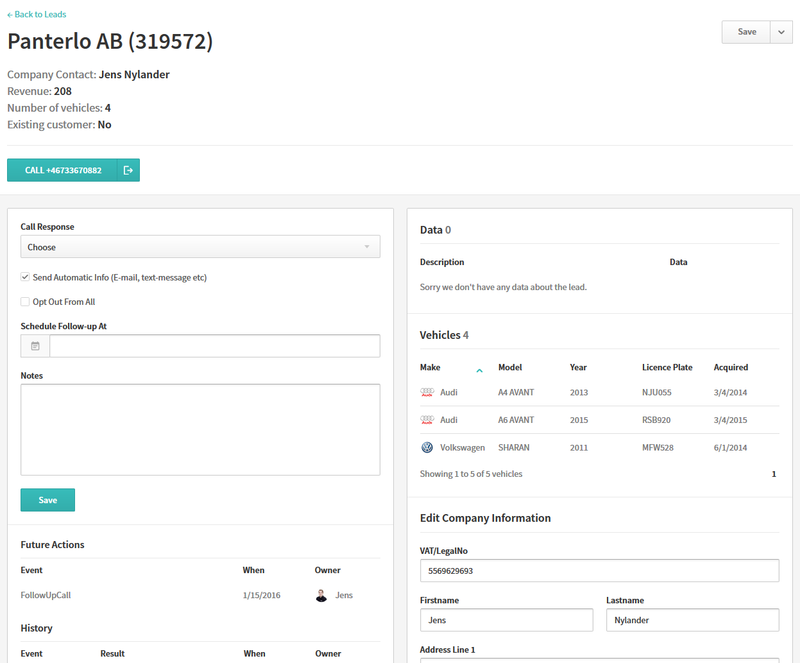 Compared to a CRM system like Salesforce this enables the sales team members to avoid complex UIs and clicks (a custom app for Salesforce would do the same). The system feeds the sales team member everything they need to close a deal.